Aaron Cook Dot Com ™ - Life, Blogging, Money. 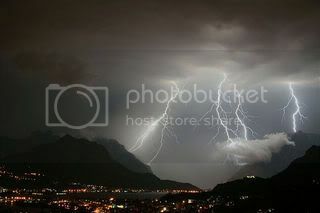 : Lightning Strikes Again - But I'm Back Online! Hey everyone, just a quick note to let you know that I'm back online as of this morning! In case you didn't know, my computer was hit by lightning again...yes, AGAIN!!! Yep, it happened Friday night...which is why I haven't been able to respond to the last 6 comments in the 8 Random Facts post. But I will! Anyway, thanks so much for your participation in the meme. And a multitude of thanks goes out for your awesome comments that followed. Oh yeah! Long story short...the Florida lightning strike totally blew out my PC's network card. But thankfully, there was no modem damage this time, unlike last time (mentioned briefly near the end of the post). Wait - I missed the deal the first time around. What's goin' on with you and lightning!? "But as for right now, I'm still in the midst of catching up on A LOT of things. See, I've gotten a bit behind ever since some of our lovely Florida lightning totally blew out my high-speed modem last Friday. Yeah. The whole fiasco had me stranded offline for a total of five (5) days! [Insert barf sound here] :P"
Yep, same here! It really drives me nuts. There's so much I need to get done that can only get done online and that is frustrating...not to mention that it costs me in lost revenue. Grrrr!